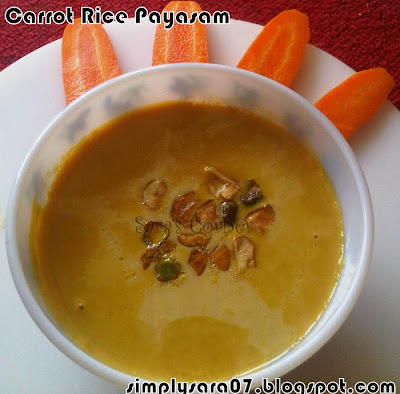 Carrot Rice Payasam/Kheer was offering/prasadam to God and on India winning WC. You can also prepare this in pressure cooker method. Wash and rinse rice in water. In thick bottom vessel, add milk and rice. Keep it in low flame. Wash carrot, scrape skin, cut into small pieces. In a mixie/blender add carrot, cashews 2nos and little milk. Grind to paste. Keep aside. Have an eye on the milk, keep stirring continuously it will overflow. Add the carrot paste. Mix well. 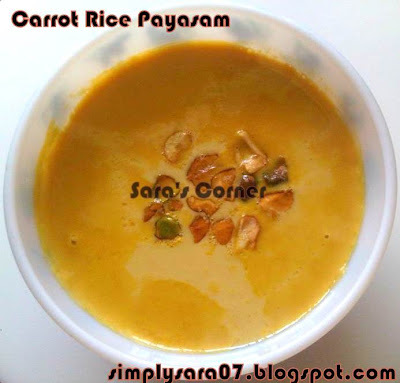 Let the rice cook and raw smell of carrot goes. The milk will reduce little bit. Add sugar and stir continuously. Keep it in low flame. Heat a pan, add ghee and nuts. Wait till its brown. Carrot Rice Payasam is ready to serve. Enjoy it warm or chill. This recipe is going to Celebrate Sweets - Rice by Priya and Nivedita. very healthy and delicious kheer !! Wow! It looks great and yummy. Slurp! Thanks Srav n Nandini for your comments. wow!! 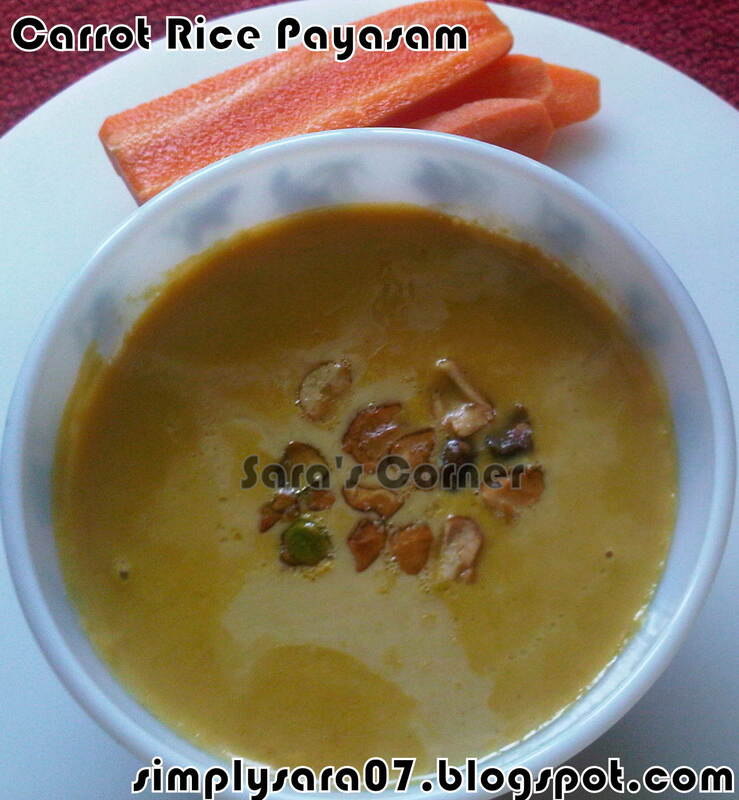 !delicious n yummy carrot payasam! !will try it saras! Wat a great looking kheer, simply delicious,thanks for sending to CS..
Yummy & creamy & delicious!! Looks creamy and rich and nice in color.